This was my first Christmas to do a personal Advent study on the days leading up to Christmas. I grew up in a church that followed that tradition but we don’t follow that now. I thought I’d try it this year on my own. I used the book: For All by Becky Kiser. HERE is a link for it on Amazon if you are interested. I’m not an affiliate so no connection if you use my link. It is workbook format and the Sunday/candle days are optional or could be used alone if desired. They are in the front of the book and not mixed in with the other days. I even made a cluster of candles from things I already had on our coffee table in the living room. I love candles and on the nights I was sitting in the living room, would light the appropriate number of candles for the week. Yes, as we got closer to the celebration of the Light of the World, the room got brighter as well! We agreed after last Christmas that we were ready for a smaller Christmas tree and I got one from Ambrose Christmas Tree Store the first week of November. I was hoping to beat the rush (and they had trees at 30% off) but my order got lost and I waited until the week after Thanksgiving and called. I was nearby the next day and they said they’d have it ready and they did! I was so pleased I got it there. Lifetime guarantee to fix and/or replace the lights or anything that goes wrong with it. Yeah! I had chosen the tree star from there and they had that in place as well. And… if a day had sunshine, about 3:30 p.m. it would make the sparkles on the star reflect onto the ceiling. Delightful! Also for the first time EVER, I bought an Advent calendar of sorts. A chocolate one! At Aldi. It must have been the 1st day they were out as I never saw them again. Glad to have The Nutcracker vs only santa. I put it away in a spare bedroom closet as I bought it before Thanksgiving! And then forgot about it until the middle of December! So I decided to do it on the days of January to make that month a bit more tolerable! I forgot and started on the 4th of January! Ha! Then had a family interruption that included an unplanned trip to Ohio on the 7th so got off track again. I resumed maybe by the 17th or so. I will watch Aldi next November for a new one! I saw this blog post idea and thought I’d try it. At least for this month! This is just my personal list — not my job work. That is enough for a busy month with customer quilting deadlines for Christmas as well. I suppose other intentions will wait for the rest of winter! 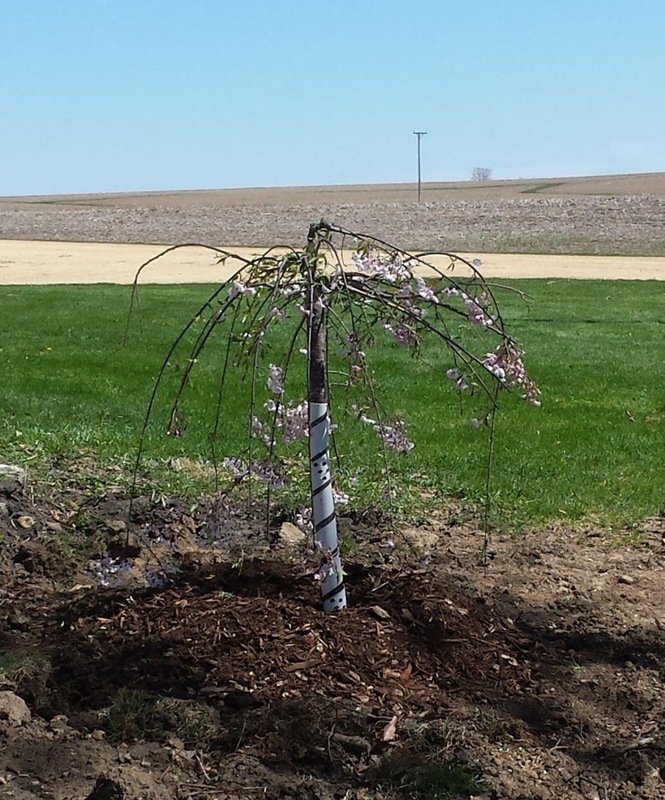 Here is our new tree — a Japanese Weeping Cherry. This is at the nursery when I picked out the tree. I know the blooms will be gone by the time it is home so this is what we’ll have in future springs. A few flowers were still hanging on when they planted it the next week for me. 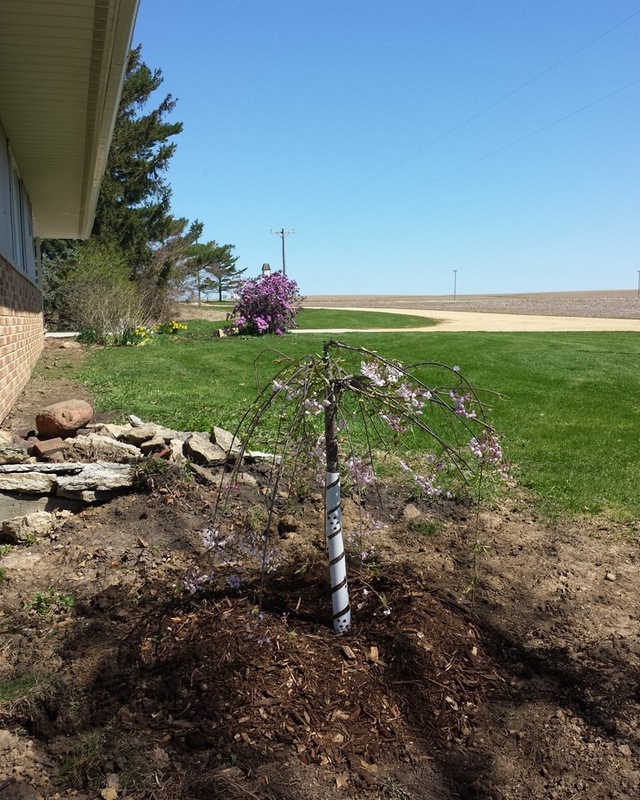 Just planted – April 27. Great crew – just 2 men and I’m not sure they were even here for 10 minutes. Dug a hole, planted, mulched, and watered. Very polite and kind men! 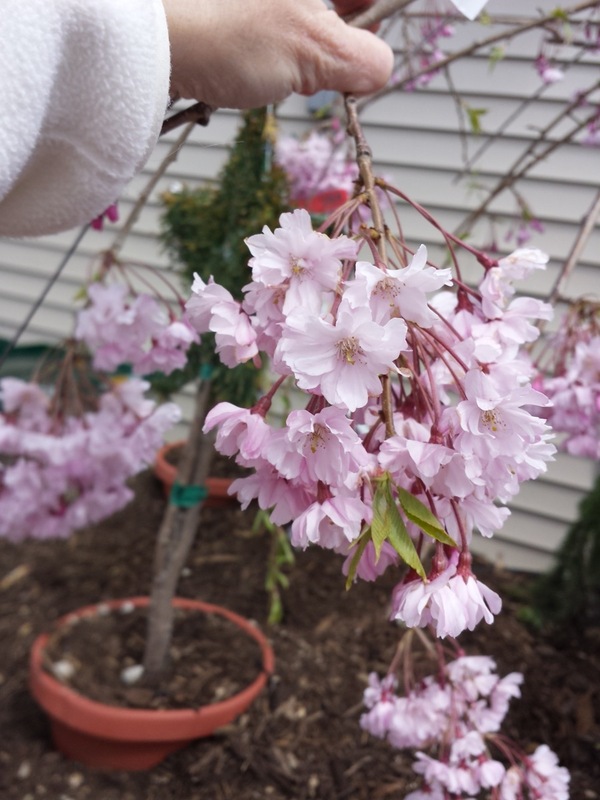 This one is only about an 8′ tree at full height and I can trim the weeping branches when needed. We also put this one a bit farther away from the corner of the house. We haven’t redone the grass or the rocks yet. Today we knocked one more thing off my list of house jobs that I need P’s help. I’ve wanted this tree replaced for years! 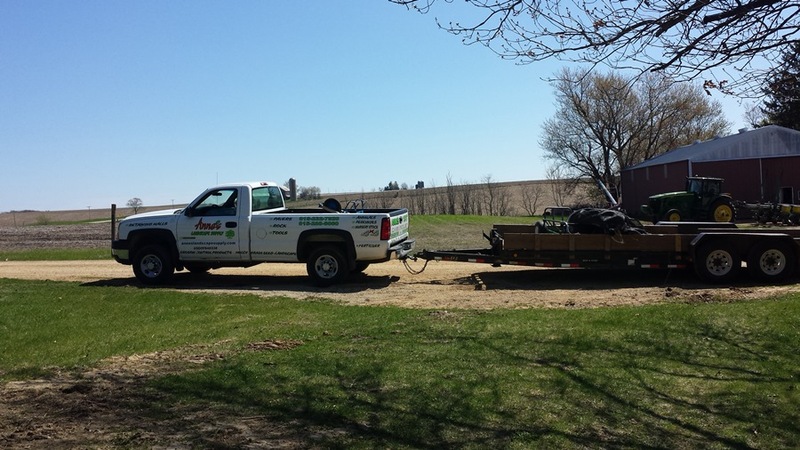 Last week I talked to the landscape place and they don’t need much lead time so I said that today we’d take out the old one. I guess P was on board with me as we got it done before rain came an hour later. After not coming in all week until 8 or 9 p.m. I was sure he’d be too tired to do this job. Chain around the tree and a big tractor to pull…..
and the tree broke off at the ground. Rotten. I said it needed to be gone years ago!! But huge roots and sucker trees coming up took a lot more work. I moved rocks and bricks, pulled branches and roots, and hooked the chain off & on. After this corner was put back to some semblance of life, we finished planting the onion starts. We have 4 kinds and P counted 40 plants of one kind. That is the only bundle with a few starts left so we probably have 150 onions. We’ve had light rain for the last 5 hours so that is good for the fields and the garden. The chairs are still in the basement!! I dyed fabric – a c r o s s – the kitchen floor on Friday and Saturday so the table was scooted as close to the dishwasher as possible. While the table was out of the way I thought I should clean. So last night, I used my big steamer for the floor. This morning, with a new breath, I asked P to shove the table to the other side of the room so I could clean the dishwasher side. My rational was the steamer was already out so I should do it now. Which led me to think the head of the steamer would fit under the stove drawer so I unloaded the drawer. Cleaned the drawer so it looks like new. Figured out HOW to get the drawer out and unscrewed it. Saw a lump of something I preferred to not identify specifically under there, so I was glad Phil was inside for the proper removal. I could then see it is not linoleum under the stove but just plywood so I only wiped it out with paper towels. I reinstalled the drawer and put less things back in there than when I started. Again my mother will “gasp in horror” as I threw away worn but “fine” pans. By then the steamer was heated and I mopped half the kitchen floor. (that part probably took me 8 mins after the preceeding 30 mins of prep)Later, there will be another breath to put away the steamer. And next week I’ll go buy a new small skillet for the next time I want an egg…. over-not-easy-neither-not-quite-hard.There went the last hour. Cleaning, setting the table, breakfast. Now I have work to do… hopefully this will suffice. It is true. I have dirt. I clean it. Sometimes. 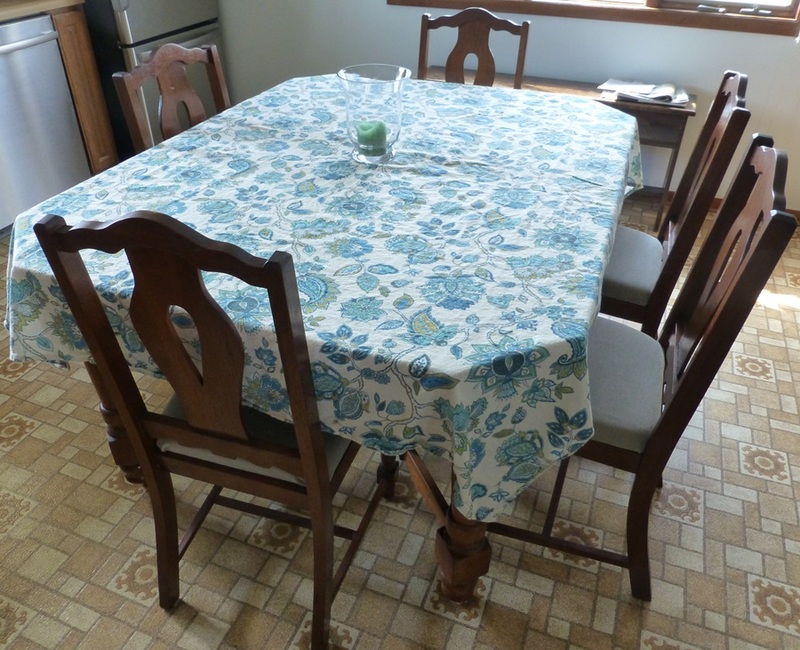 I was pleased I had the chairs done awhile before Easter so that we would have enough chairs to use around the table. 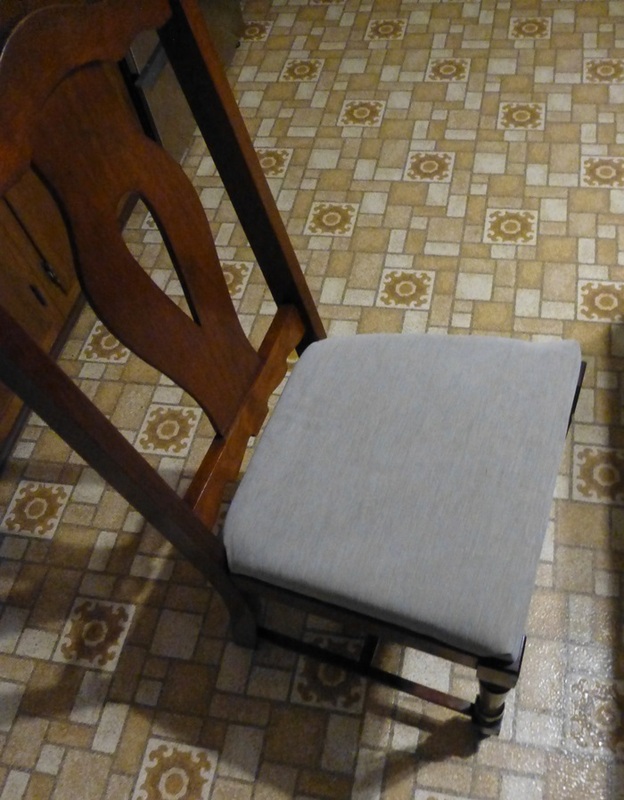 I worked a few evenings on covering the seats in my private sewing room. I covered my good work table and it was so much nicer to work standing up than crouched over the floor as I had done with the gluing process! P brought his smaller air compressor inside and I was able to learn to use it. I did it! KaBAM!! And it was fun. The chair seat is a very old piece of wood and many times is several sections joined (sort of) together. I layed 1″ of the cheap green foam you can get in a Joann’s or Hobby Lobby (big box) store, quilt batting, and then the fabric. I had bought that fabric a good year ago. It has a bit of undercoating so maybe it is a bit water-repelling for the larger spills. 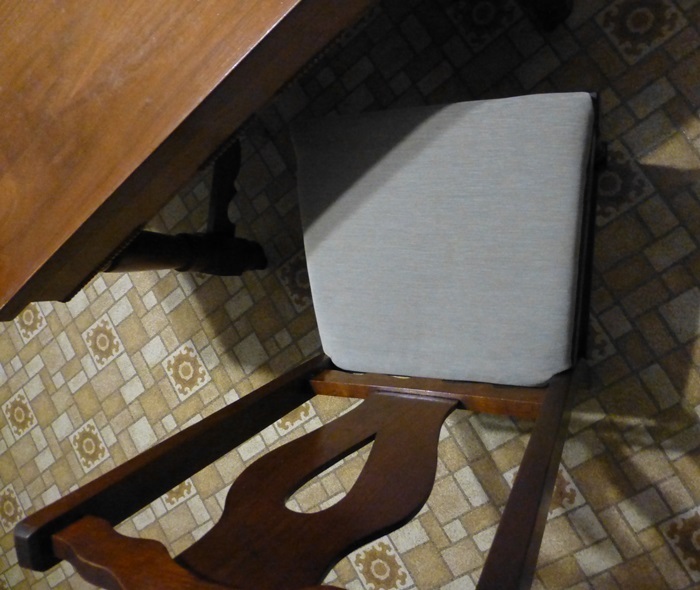 Over several evenings, I recovered the seats of the 5 matching chairs and a chair that matches our computer desk to be #6 at the table. Once I had them recovered, another evening I had P screw the seats to the chairs. I was VERY happy to have them done that evening!! My mother-in-law was pleased I had the table and chairs all together for Easter! The chairs match the table but I’ve always kept the table covered. 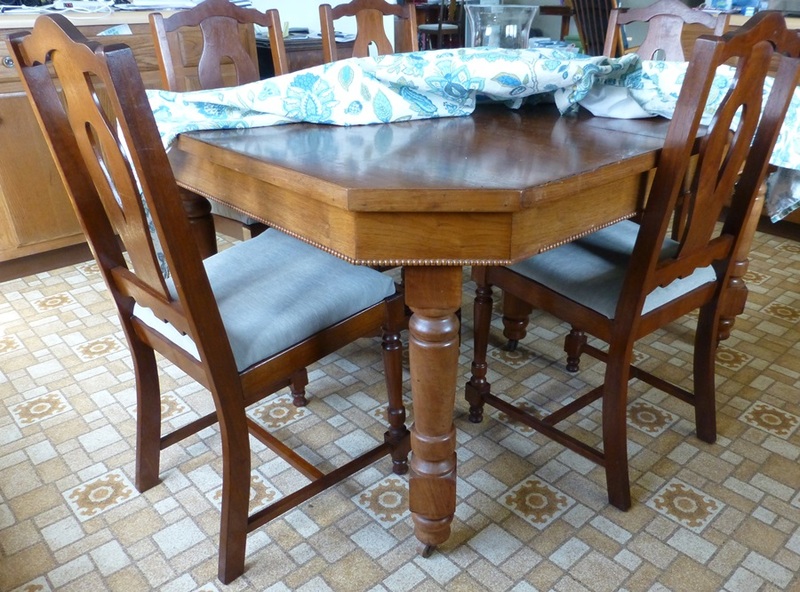 It is a veneer top and with tacked on beaded trim that has become un-tacked over the years. Originally at P’s grandparent’s home — MIL found me a few photos. The needlepoint pieces have been framed with barn board frames from FIL’s side. My dad made the frames. One seat cover had been damaged and the other four were framed for MIL, SIL, Miss K, & me. Saved and lovely! In this process this winter, P & I were sure we had a captain’s chair for the table. We couldn’t find it anywhere! We saw an upholstered chair (more like a sitting room chair to me) and P thought that was it. No way! It didn’t match! 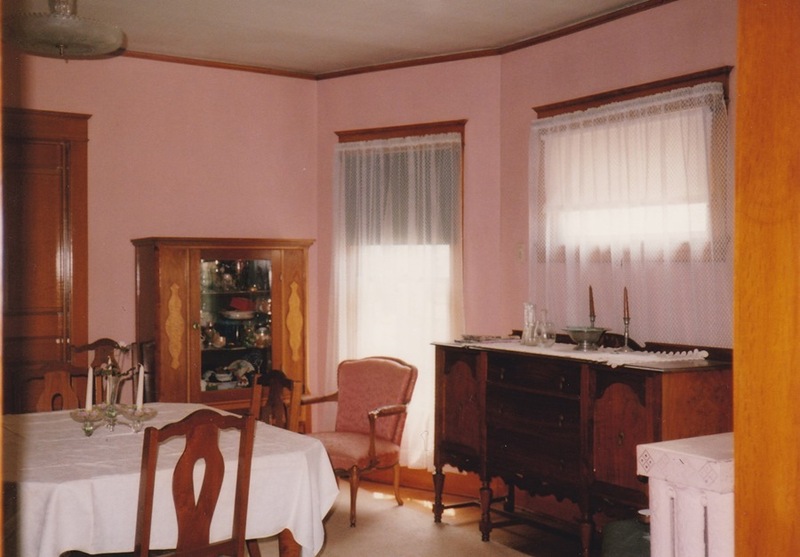 Then MIL got out these photos and sure enough… they used the upholstered chair for a captain’s chair. We are not following that use. It would be great to have it reupholstered and I’ll probably need to hire someone for that piece. Phil & I and Miss K have many years of memories seeing P’s Gma at this house. 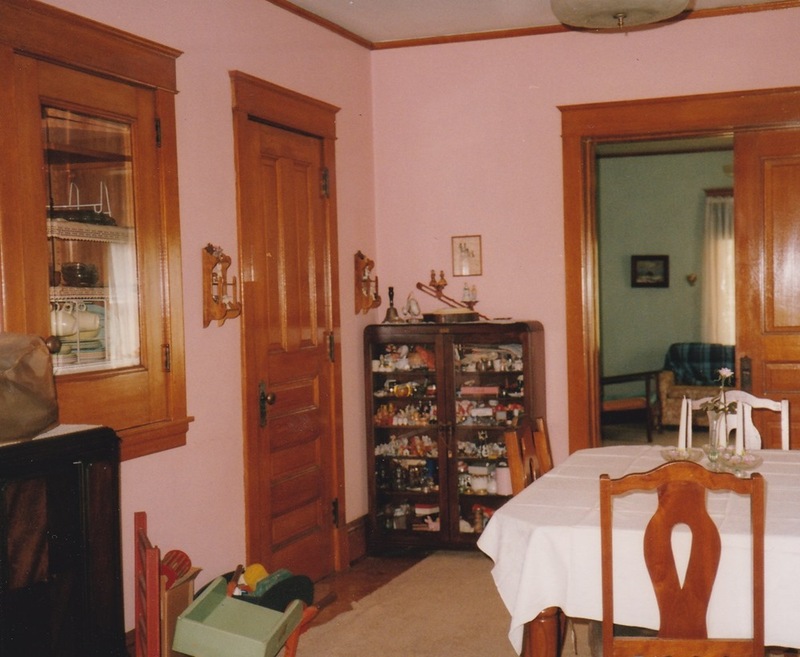 The woodwork in this home always just took my breath away! The entry room was large and had an open and wooden staircase with landing. P’s Gpa made a lot of wooden toys as well and some are clustered in the lower left corner of this above photo. 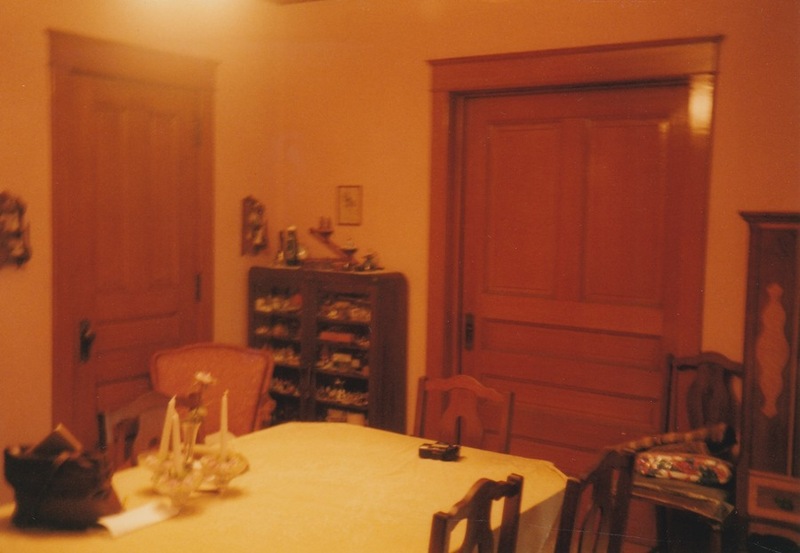 This is taken of the dining room (the built-in and pass-through cupboard to the left and the main living room with pocket doors nearer the right of the photo. Phil doesn’t remember his Gpa except for knowing he died in a farm accident and that this Gpa had a Massey-Harris tractor. Grandpa died in October of 1962 at the age of 61 years, so P was just a few months old. 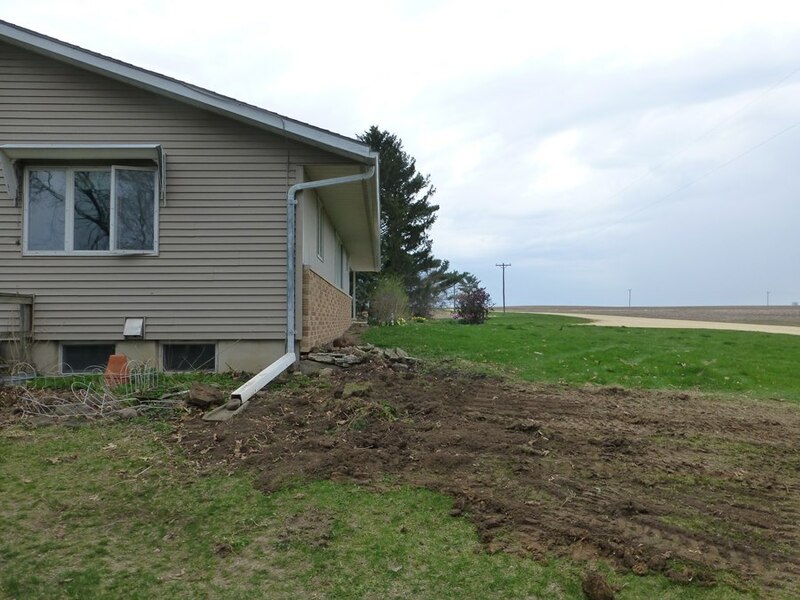 My in-laws got a call there had been an accident at the farm while Gpa was there alone milking the cows that morning. 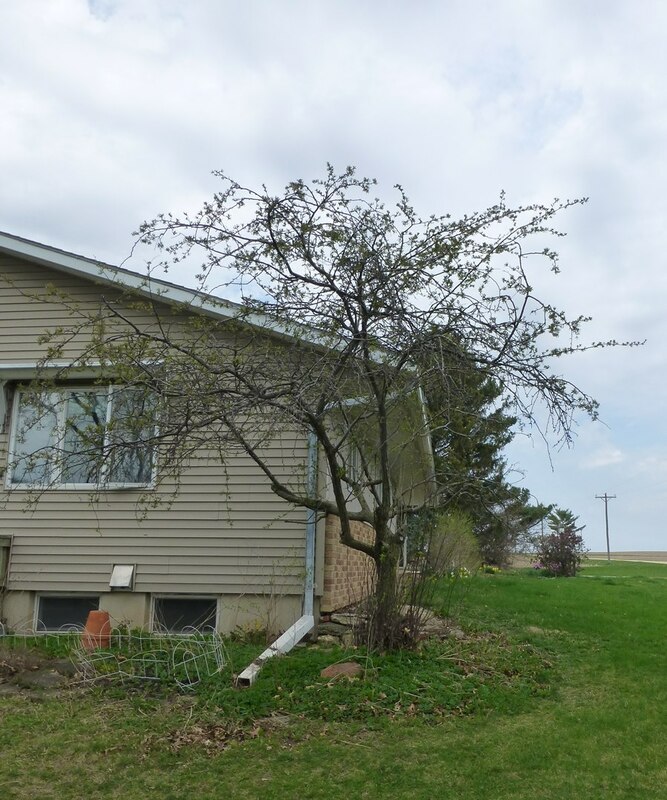 P was quickly taken to the neighbor (Shaners) for care, his sister was in school for the day, his mom went to the house in town (above) to stay with the Gma, and P’s dad/FIL went to the farm to the accident scene. It was because Gpa hadn’t returned home as usual that someone was sent to the farm to check on him and found the accident. Gpa was still alive after being pinned under his tractor for several hours and the emergency crews worked to free him. He was first taken to a local hospital and then transported by ambulance to a bigger hospital about 3 hours away. He died there the next day. P’s uncle was single and in the military at the time and the Red Cross had to work to find him and bring him home for the funeral. He was given a discharge from his continued service as being the only son in the family. Phil’s cousin & her husband had come over for some things and he is a wood-worker. A very good wood-worker during his young retirement years. He & I notice in comparing 2 chairs that this broken one had only had 2 metal underseat/chair leg supports instead of 4. He willingly took home the pieces of chair, handmade 4 wooden and better chair seat brackets and returned it 3 days later in time for a lunch of 6 we were hosting! I kept the other wobbly chair in the spot where I normally sit and it continued to wobble. 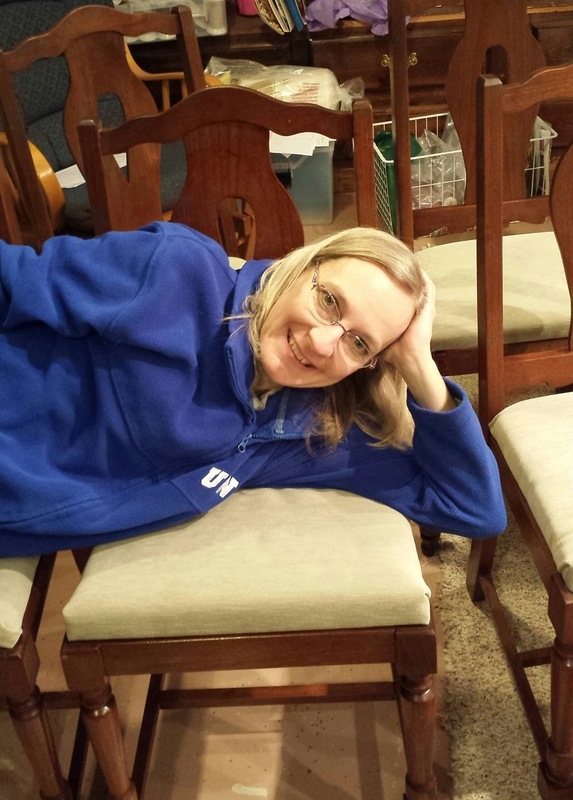 So as of 7/23/15, this chair, too, has gone to the cousin’s to get the extra brackets added. He does lovely work! However, I learned the hard way that I should have wiped down the chairs after the Old English scratch repair as it dried gummy. I can use 0000 steel wool and get off the gummy without damaging the finish. 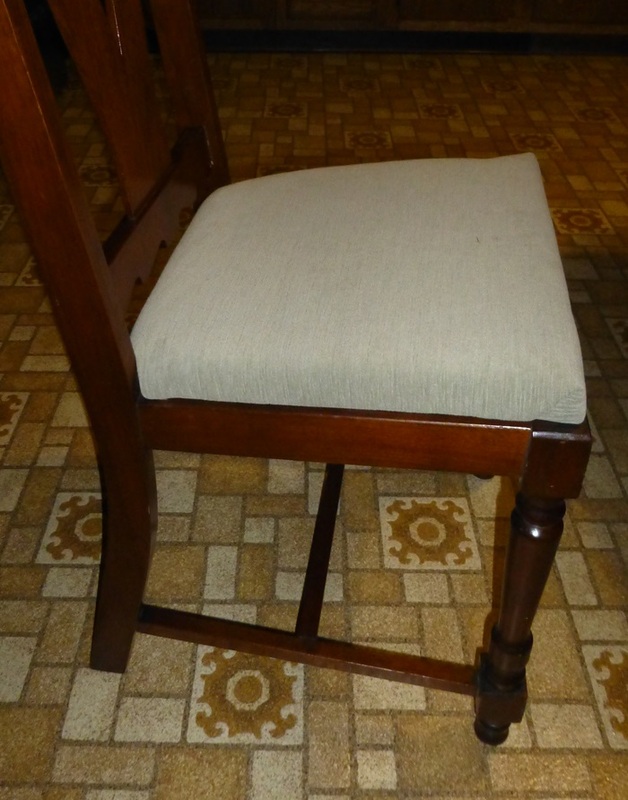 I’ll do that next for all the chairs and then return to the upholstery.